The task wasn’t as easy as it sounded. Quinnipiac (13-13-8, 6-9-7 ECAC) had to face No. 5 Union on Friday and No. 13 RPI on Saturday, needing to beat one or tie both. The latter ended up playing out. With the ties, eighth seeded Quinnipiac will host ninth seeded Brown in the ECAC playoffs this weekend. 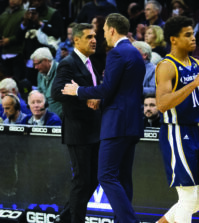 The two teams tied both of their regular season meetings this year. The series will be best of three, and the winner will advance to the semifinals to take on Union, Yale, Dartmouth, or Cornell. 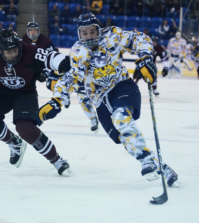 The Bobcats skated to a 2-2 tie on Saturday against RPI (19-10-5, 11-9-2 ECAC). Guy Leboeuf put the Engineers up 1-0 two minutes into the game when he found the five hole of Quinnipiac goalie Eric Hartzell. John Kennedy received the primary assist on the score while Tyler Helfrich took the secondary. Right around the same time in the second period, the Bobcats struck. Yuri Bouharevich did his best Ovechkin impression as he fell in the slot with the puck but kept control to put it past goalie Allen York while still sliding across the crease. The Bobcats then took the lead as Brooks Robinson deflected a shot from the point by Zack Currie. The goal came at the 7:14 mark of the second period as Currie and Ben Arnt were given assists. Quinnipiac could not hold on to the lead when Joel Malchuk found the back of the net. His goal came off the rebound from a shot taken by teammate Greg Burgdoerfer. Quinnipiac kept the game locked at two through overtime to earn the eighth and final home ice slot for the ECAC quarterfinals. 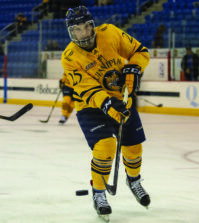 On Friday, Quinnipiac skated to a 2-2 tie against Union (24-7-4, 16-3-2). QU trailed by two in the second period, but Robinson narrowed the deficit to one when he hit the twine at the end of Quinnipiac’s power play. Kellen Jones took a shot from the right face-off circle that was blocked by a Union defender. The puck was then lifted towards the goal when Robinson decided to imitate Jackie Robinson and batted it past Dutchman goalie Keith Kinkaid. With less than seven minutes left in the game, John Dunbar made sure the Bobcats were getting a point. Connor Jones won the face-off in Union’s zone, and passed it to his brother Kellen. Kellen Jones hit Dunbar with a pass between the face-off circles and then ripped a shot that would tie the game. The Jones twins were both awarded an assist on the play.